SNOWMASS VILLAGE — Elected officials from Snowmass Village on Monday deferred a decision on the Viceroy Hotel’s second phase for at least a week to allow more consideration of developer Related Colorado’s proposal for public improvements, a construction timetable and vesting. Opposition was relatively minimal to the general concept of the Viceroy’s second phase, also known as 13B, which would add 67 units and a workout facility to the upscale hotel, which has received a four-star rating from AAA, among other accolades. Discussions among Snowmass Village Town Council members centered on the slightly changed unit mix; for example, there are more two-bedroom units now planned than first proposed. Recognizing that the building originally was designed a decade ago and that market conditions have changed since then, the council seemed to have little problem with this point or the proposal that employee units be marketed as rentals rather than for-sale units. The project, approved with 1 million square feet of development in 2004, has been largely stalled for four years; Monday’s meeting was the first time the developer has been in front of this council with a significant building request. The sticking points came when Related Colorado President Dwayne Romero wanted to tie an extension of the project’s vesting to completion of a roundabout and improvements to Wood Road, upgrades that were part and parcel of the original Base Village approval. The current project approvals run through November 2014, and Romero had sought at least a five-year extension as an “interim milestone” that would ostensibly provide additional time for planning, building and marketing some of the buildings and completing these improvements. Town Engineer Dean Gordon suggested that the roundabout and the Wood Road improvements were long overdue. “It’s important right now to let the applicant know we really need to get a handle and timeline (for) when that roundabout is going to be completed,” he said. After a discussion spanning more than 2 1/2 hours, the item was continued for a week so the development team can mull over a staff suggestion tying the certificate of occupancy on 13B to completion of the road improvements. Another option suggested to the developer was guaranteeing the public improvements with a bond. When the parties convene again Aug. 12 for a possible first reading of an ordinance regarding the Base Village building 13B minor planned-unit-development amendment, there also will be discussion about extension of the vesting that’s set to expire next year. Romero also took time to run through general concepts, or “big-picture items,” for the unbuilt portions of Base Village. He said Related Colorado will present details of a major planned-unit-development amendment by Dec. 31 for elements that may include an arts facility and a full-blown, 100-plus-room hotel (as compared with a condo hotel, which describes the Viceroy). 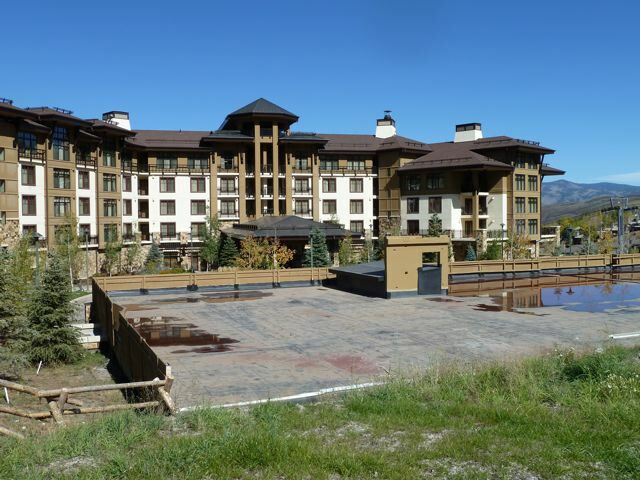 Sources say a Limelight-type hotel is envisioned for this site near the Elk Camp Gondola. Editor’s note: The Aspen Times, in collaboration with Aspen Journalism, published a version of this story on its website late on Monday, August 5 and in its printed edition on Tuesday, August 6, 2013.